Violence is a prominent element in the functioning of all societies in Central America and other companies in the world. Some studies have identified the genesis of the phenomenon of war in the late 80s which resulted in a shift of the conflict, from rural areas in the beginning and then moved, in urban areas in the form of organized crime. Up to 90 years' 23% of all homicides recorded in Latin America were committed by young people aged between 10 and 19 years, while 34% were made ​​by young people between 20 and 29 years and still, according to statistical data from 2000 to 2010, more than 48% of male detainees accused of murder, were young people between 18 and 25 years. According to statistics, most of the acts of violence perpetrated in the world are committed by males aged between 15 and 24 years. More than half of the population in Central America has less than 25 years. Because young people constitute the majority of the population, it is logical that these companies are more vulnerable to violence. There is no doubt therefore that they are protagonists in the Central American social landscape, but it is equally beyond doubt that they are scapegoats for even the unjust and unequal society that does not give them any opportunities and in which power is concentrated in few hands. More than 1 million children are held through justice systems around the world, even if it is not to be underestimated, however, the difficulty of obtaining data on undeclared many children in detention. Very often the data collected does not include children awaiting trial, detained children with their parents and children are held temporarily by the police. This estimate is actually considerably higher. Bluefields, may 2011, Nicaragua. 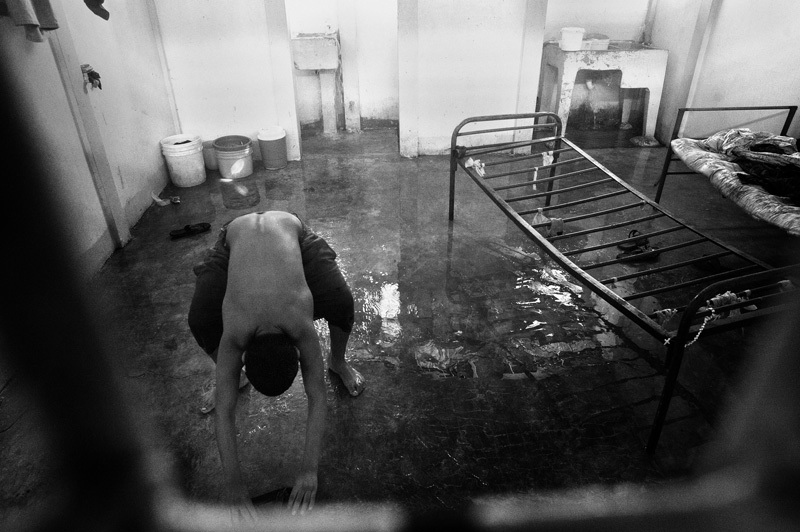 Inside Antonio Garcia's cell, 16 years old. He must serve another year and a half for assault.